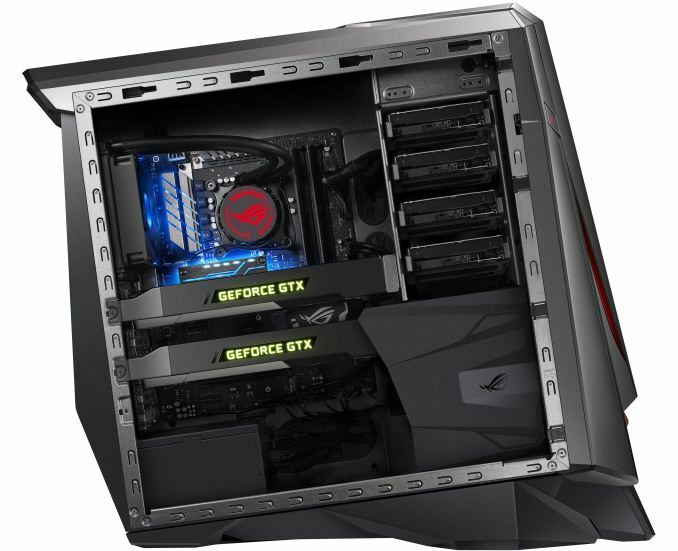 ASUS this month finally began to sell its high-end ROG GT51 desktop in the U.S. The system comes equipped with a factory-overclocked Intel Core i7 processor, two GeForce GTX graphics cards in SLI mode as well as two NVMe PCIe SSDs in RAID 0 to maximize performance. 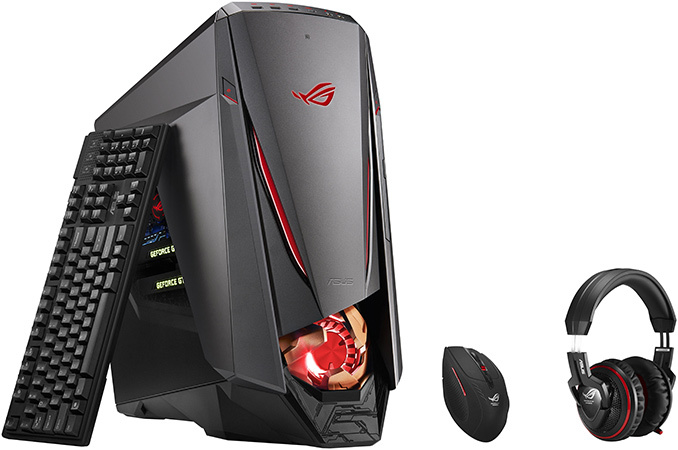 The fully configured ROG GT51 system costs $4999 and marks ASUS’ entry on the market of high-performance desktop PCs. ASUSTeK Computer was established in 1989 with the purpose to develop and build computer motherboards. The company quickly became famous for its mainboards and by the early 2000s it was the world’s No. 1 producer of mainboards and a leading maker of PC components in general. Starting from 2002~2003, ASUS began to diversify its business and started to make products like notebooks and various peripherals, and in 2006 the company established its Republic of Gamers (ROG) sub-brand for computer components designed specifically for gamers. Eventually, ASUS came up with high-end ROG laptops as well as gaming displays and even became the largest supplier of the aforementioned product categories (at least, according to its own statements). However, despite the fact that ROG-branded motherboards have been used by performance enthusiasts and a variety of boutique PC makers for their builds for a while, ASUS itself did not actively engage into desktop PC market until circa 2014, when it introduced its ROG G20 SFF PC and ROG GR8 console based on custom form factor designs. Over the last couple of years, ASUS has showcased various region specific builds, but the GT51 is the company’s first gaming desktop build to challenge high-end machines from well-known brands. It took the company quite a while to finalize the design and it is finally available for purchase. The ASUS ROG GT51CA is based on Intel’s Core i7-6700K CPU that can be overclocked in one click to 4.60 GHz as well as a proprietary Intel Z170-based motherboard. The processor is cooled using an ROG-branded closed-loop liquid-cooling system, which fan also acts like an exhaust fan for the whole PC. The system comes equipped with two ASUS GeForce GTX 1080 graphics cards running in SLI mode, 64 GB of DDR4-2800 memory (4×16 GB), two Samsung SM951 512 GB M.2 SSDs operating in RAID 0 mode and with a 1 TB HDD (which has 7200 RPM spindle speed). Since we are talking about a serious gaming PC that has to compete against products from companies like Alienware and Origin PC, the ROG GT51CA can be further customized by their owners, but not built-to-order by retailers. For example, the end users may install faster memory, up to five 3.5”/2.5” HDDs or SSDs, different M.2 drives and so on. and partners may offer different configurations. As for connectivity, the ASUS ROG GT51CA has gigabit ethernet, 802.11ac 8x2 Wi-Fi, multiple USB 3.0 Type-A ports (including two on the front), one USB 3.1 Type-A (10 Gbps) and one USB 3.1 Type-C (10 Gbps) port (both on the front). The audio of the PC clearly deserves a mention because ASUS has installed an audiophile-grade ESS Sabre headphone DAC and amplifier to improve audio quality to the front audio outputs. Meanwhile, for some reason the company decided not to equip its top-of-the-range system with one of its Xonar discrete audio cards and the ROG GT51CA still relies on a 7.1-channel integrated audio solution (which is typically an improved ALC1150 audio solution from ASUS). Yet another exclusive capability of the ROG GT51CA is the ROG Band, which can be used to access a hidden hard drive space as well as the overclocking mode. Like systems from boutique PC makers, the ASUS ROG GT51CA has custom dynamic LED lighting effects (eight million colors, four zones) and comes with a mechanical keyboard and a gaming grade mouse with matching design. Unfortunately, at this time ASUS does not offer aerography for its machine. 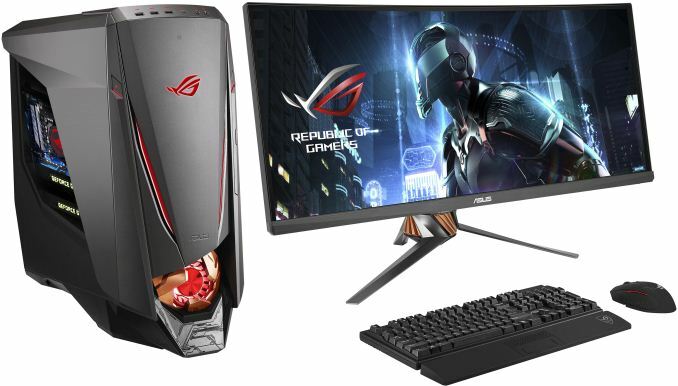 The ASUS ROG GT51CA premium desktop is available from Amazon, B&H Photo and some other retailers.